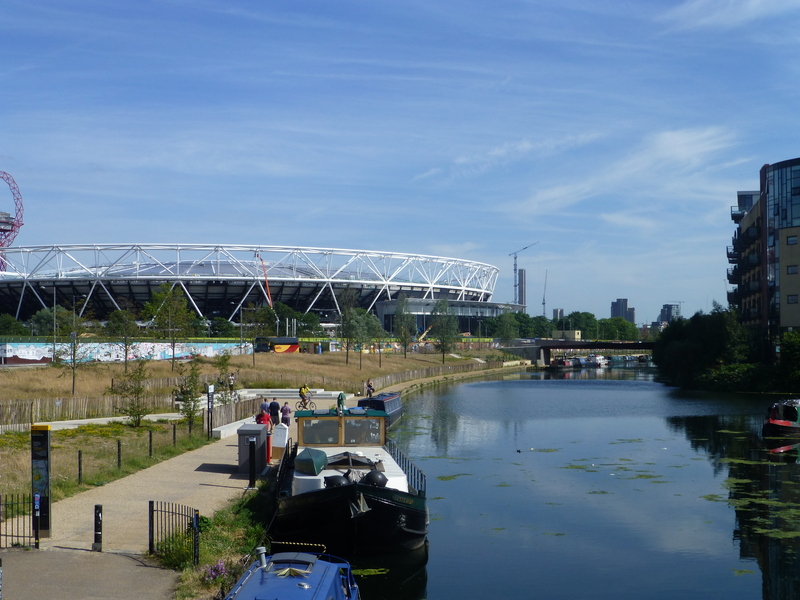 Whether a fan of Street Art and Graffiti or not a walk around Hackney Wick & Fish Island is worth it in its own right with the canals, the Olympic Stadium and quite a bit of accompanying wildlife to be seen. 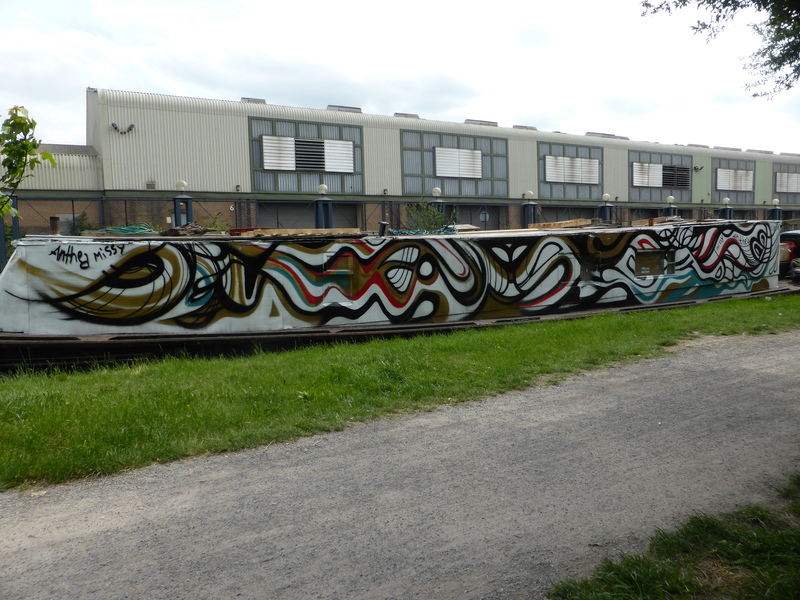 However in terms of artistic viewing this is an area with regular additions and changes to the Street Art & Graffiti and well worth regular visits and certainly worth a visit in the Summer to fully enjoy the waterways. The area has seen a lot of change and redevelopments in recent years in the run-up to and the wake of the London 2012 Olympics, with this the industrial and almost baron features of the area are becoming more and more gentrified, with the whole area set to be redeveloped in the coming years. 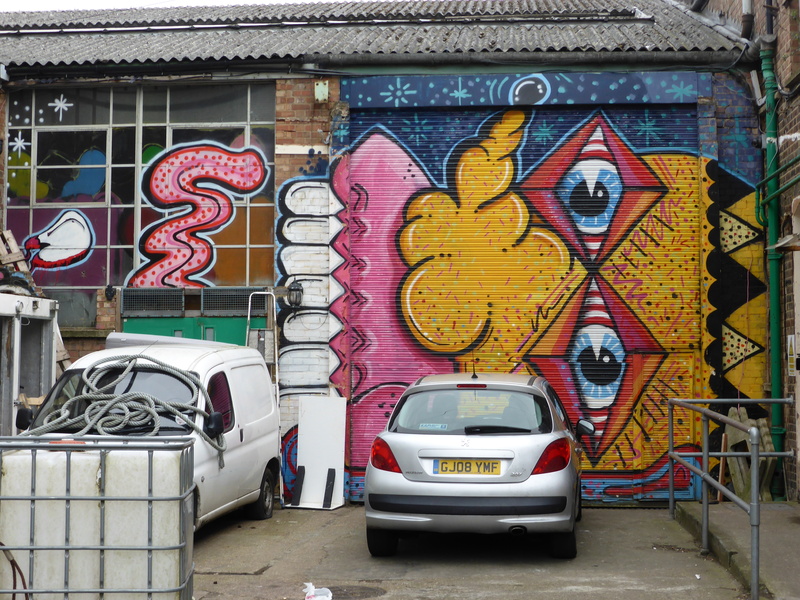 Hackney Wick and Fish Island have a long tradition as a home to artists and art spaces and is currently considered to provide one of the highest densities of fine artists, designers and artisans in Europe. 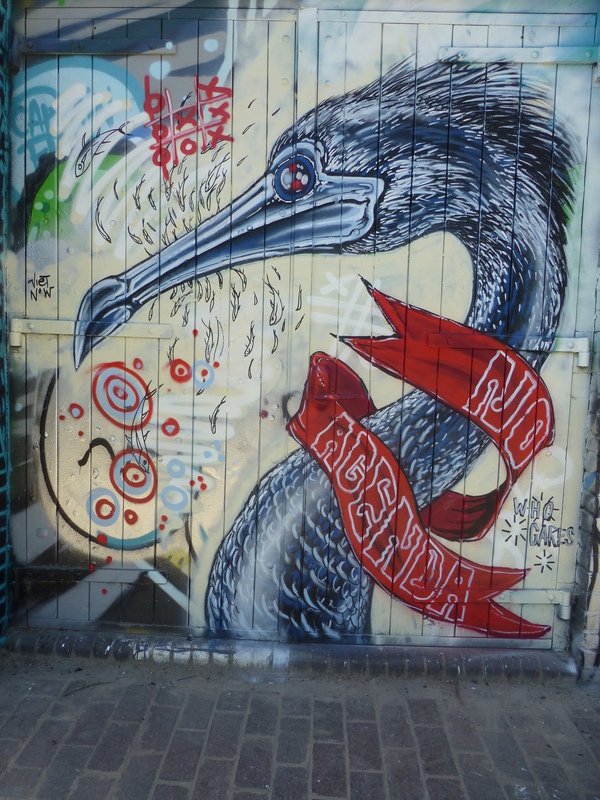 So it’s no wonder that this area has so much Street Art and Graffiti to be seen, from a wide range of artists, and this is the purpose of the walk provided here. 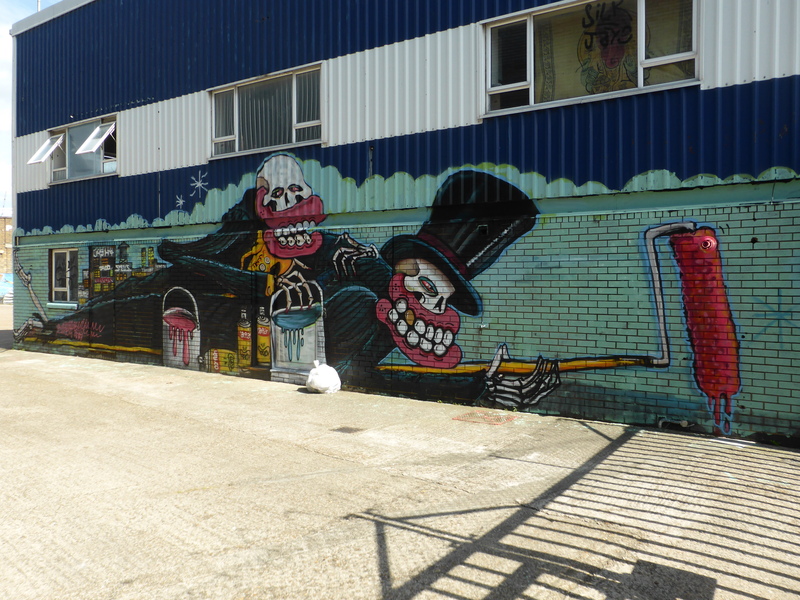 This walk will take you 2-3 hours and begins and ends at Hackney Wick Overground Station. 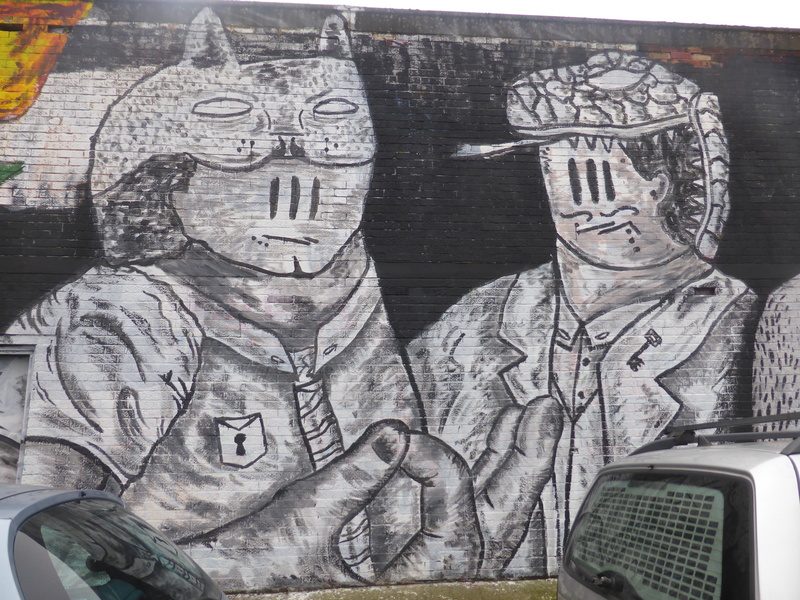 1: Upon exiting Hackney Wick Overground Station turn right into Wallis Road and follow the road all the way around to the right, along here you will pass some hoardings that feature a host of Graffiti and some work by Malarkey. 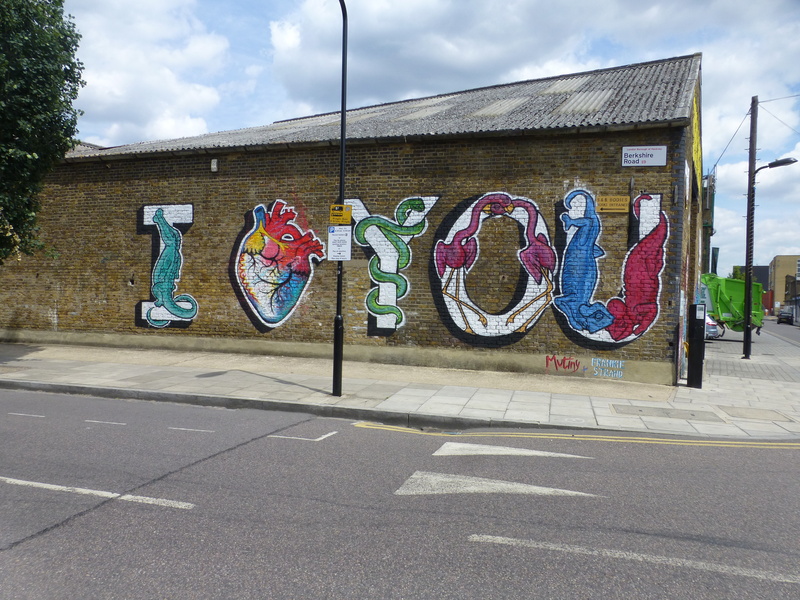 follow Wallis Road round the corner to see some superb recent additions to Hackney Wick with works from Louis Masai, Bailon, Sliks & Thierry Noir. 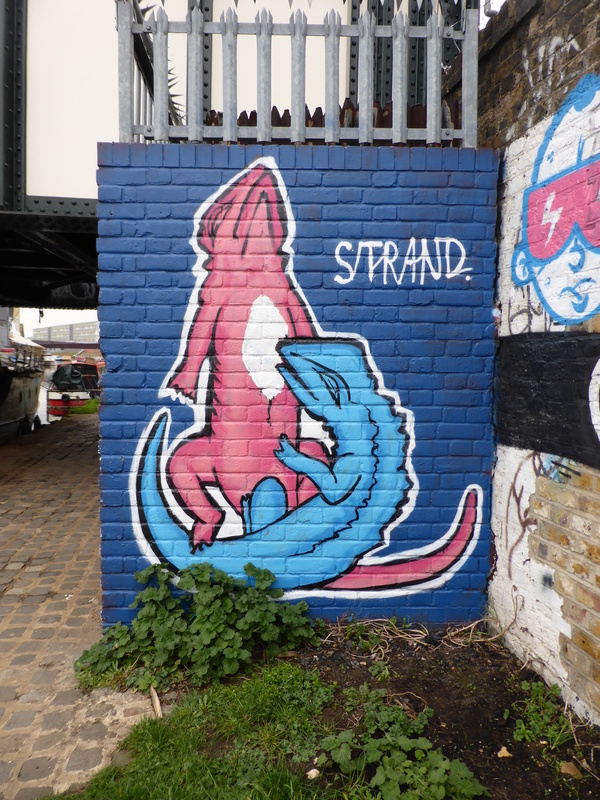 Collaboration work by Frankie Strand & Jane Mutiny at the corner of Wallis Road & Berkshire Road. Collaboration work by Jane Mutiny & Pang at the corner of Wallis Road & Berkshire Road. 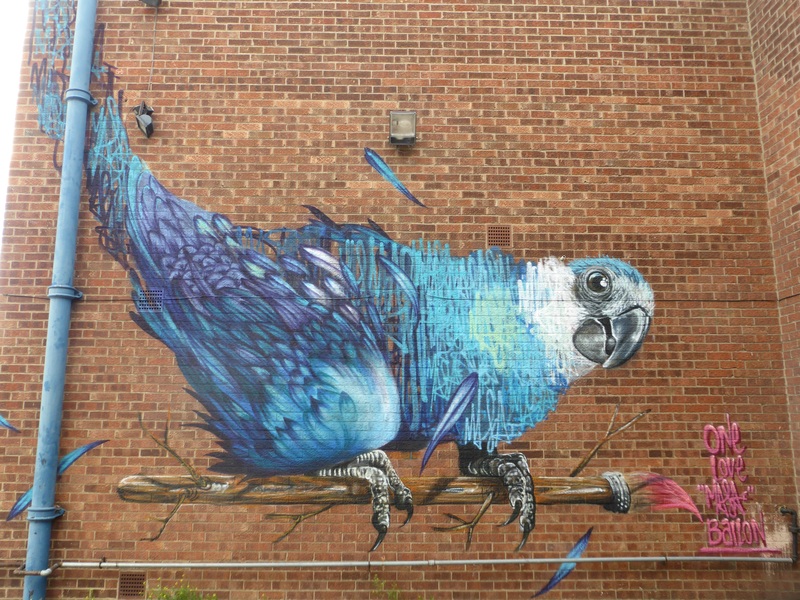 Collaboration work by Louis Masai & Bailon. 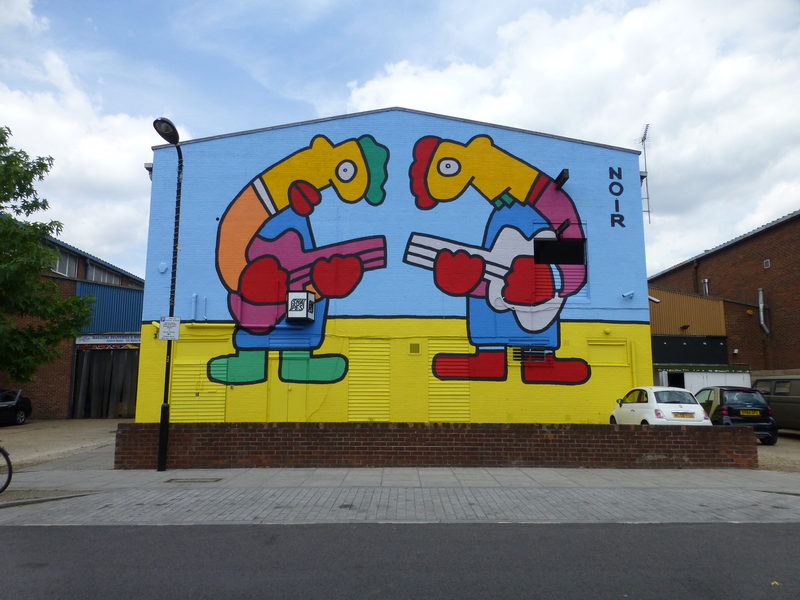 2: When you reach the Thierry Noir work in Wallis Road, turn back and head back past Hackney Wick Overground Station passing along Hepscott Road where you will be confronted by the well decorated Lord Napier Pub, once here turn left into White Post Lane and follow the road around to the right and then continue along the road along to the left all the way until you reach the Canal. 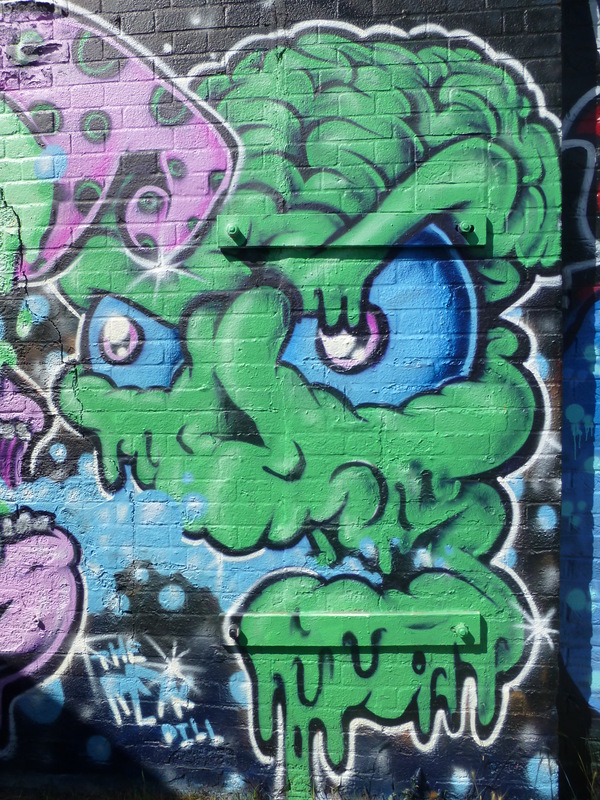 Along this stretch which is a mere five minute walk, providing you don’t stop to appreciate all the wonderful and often changing Street Art and Graffiti to be seen along the walls and hoardings in White Post Lane, so it will take you a fair while to take all this Street Art and Graffiti in. 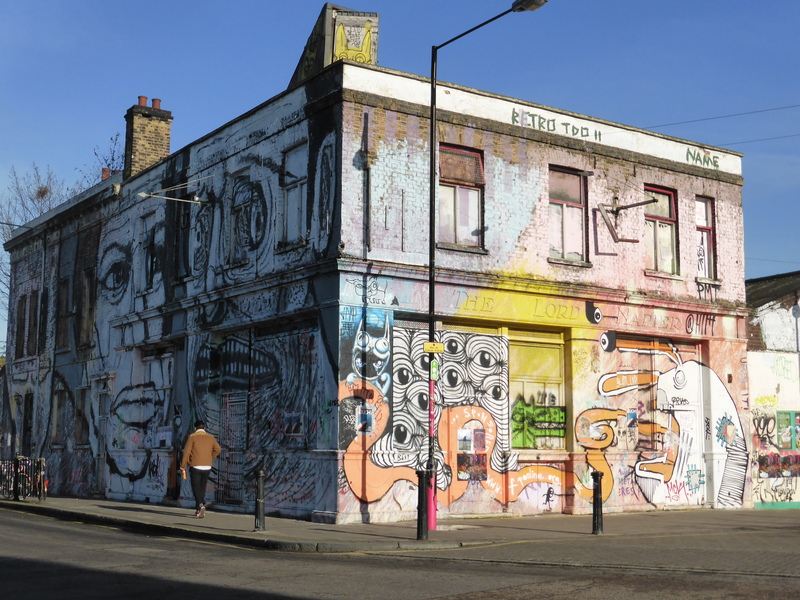 The now abandoned Lord Napier Pub covered in a myriad of works from artists including Nemo’s, Himbad, Noriaki, Float and many more little gems to explore. 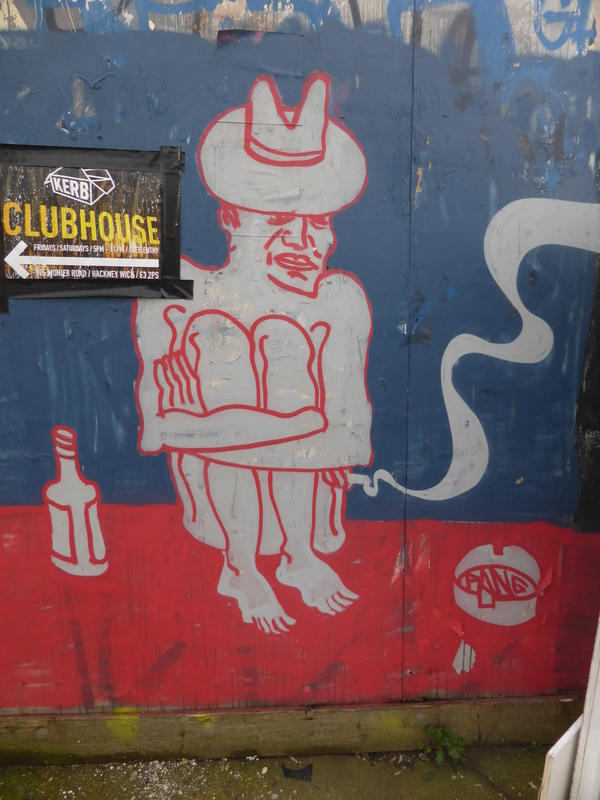 Small-scale subtle work from Float on the Lord Napier pub. 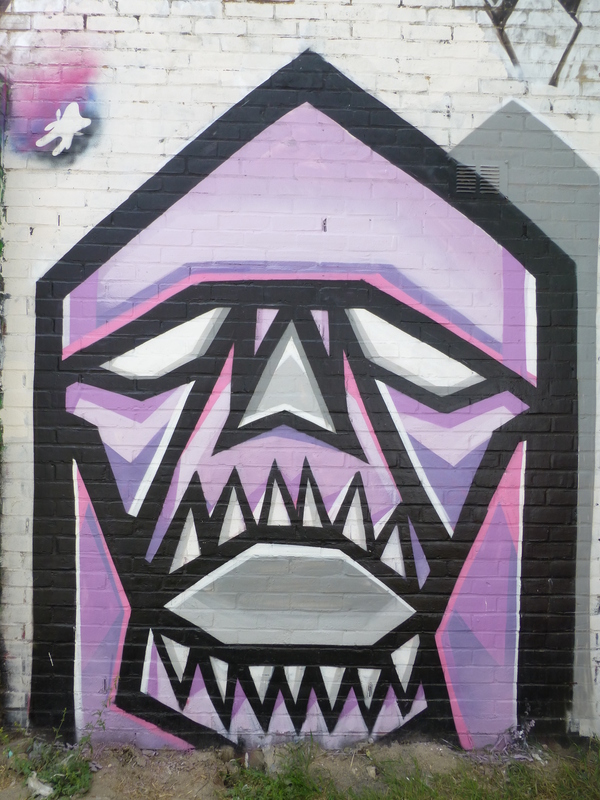 Work by Trans1 in White Post Lane. 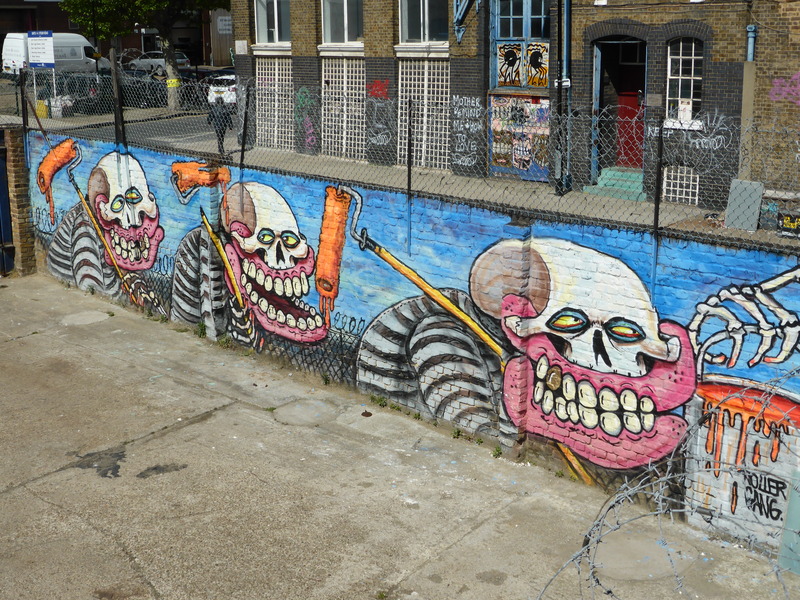 Work by Edwin in Queen’s Yard, just off of White Post Lane. 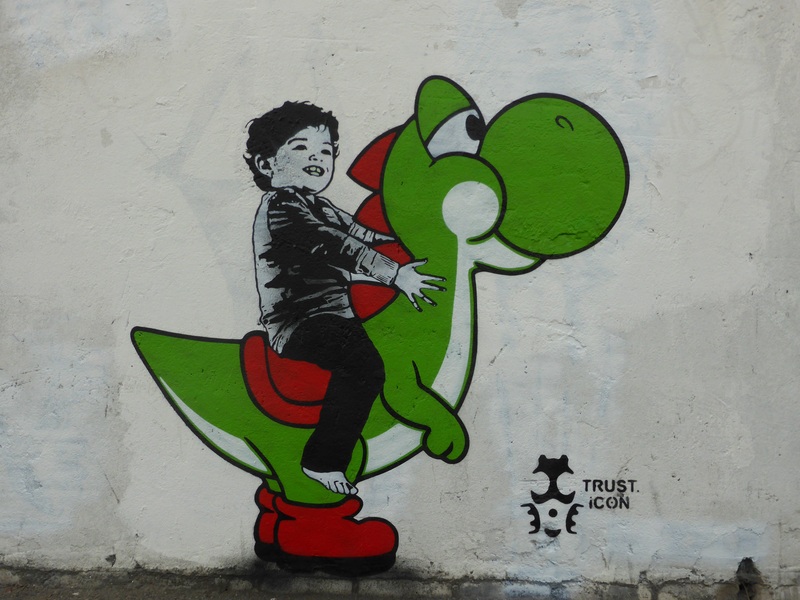 Work by Trust Icon in White Post Lane. 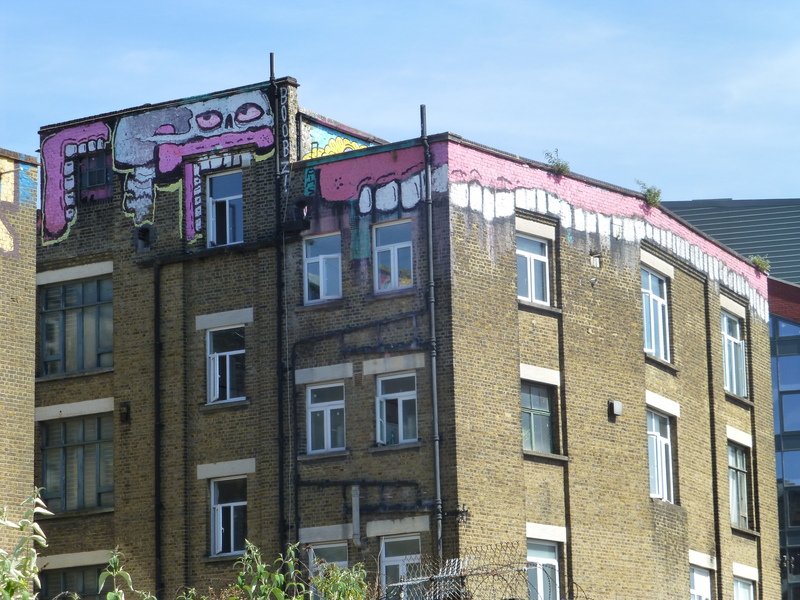 Rooftop work by Sweet Toof in White Post Lane. 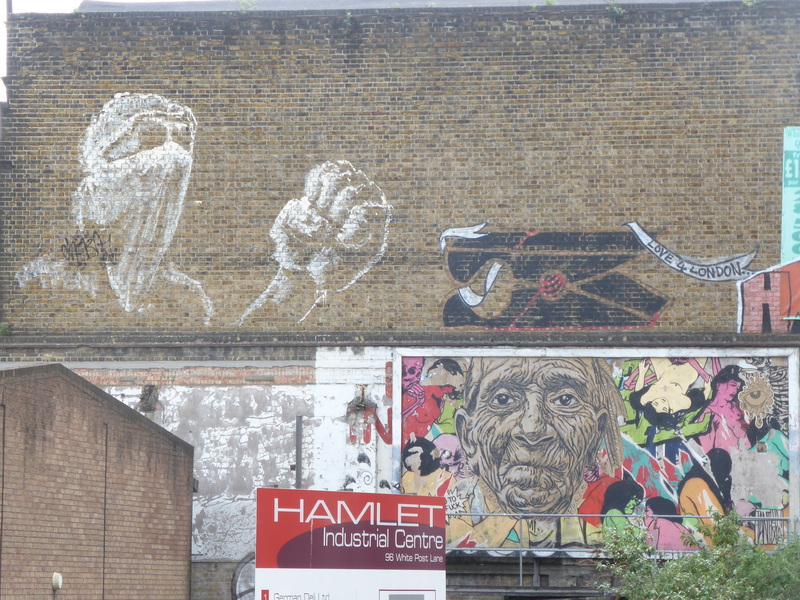 High level work by Alaniz & Pyramid Oracle on the billboard in White Post Lane. 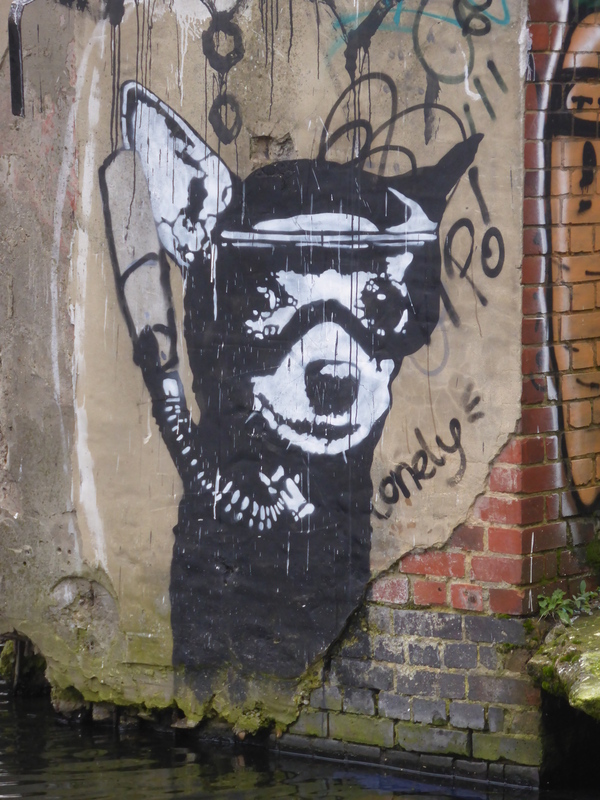 Work by Pang in White Post Lane. 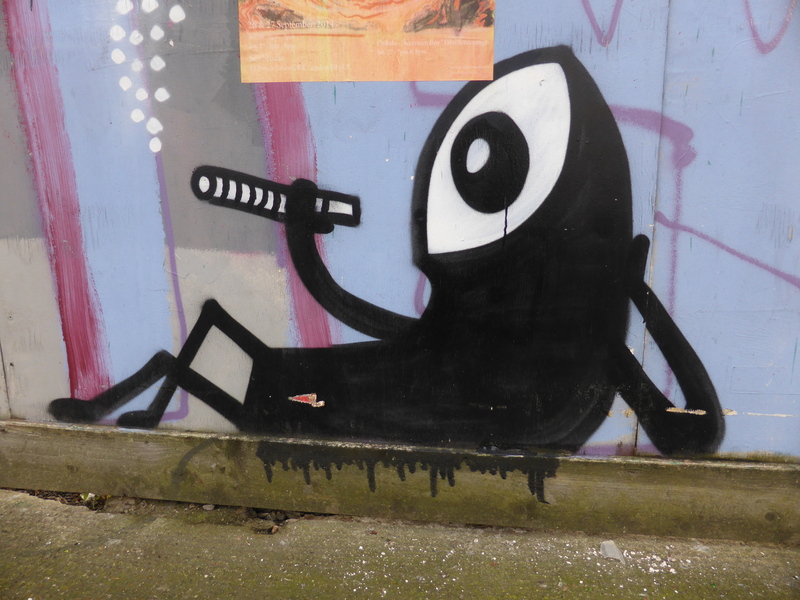 Work by Noriaki in White Post Lane. 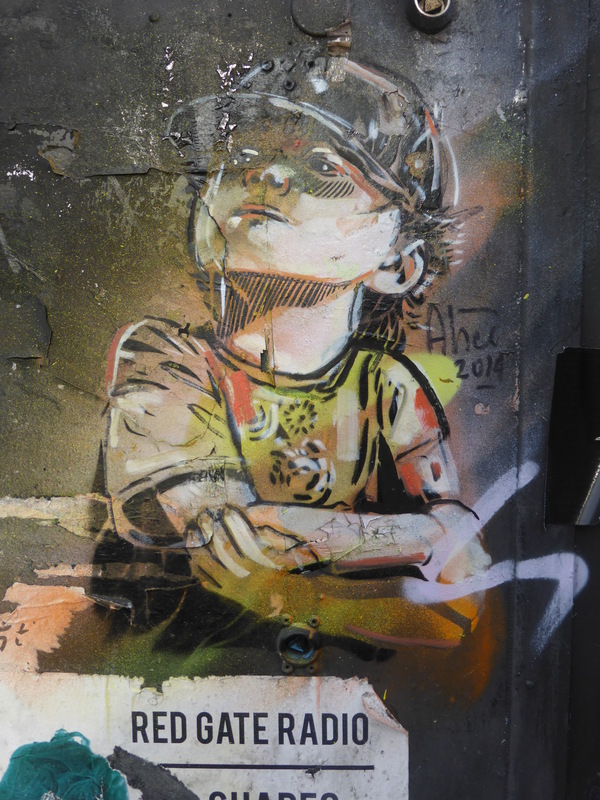 Work by Alice Pasquini on a cable box in White Post Lane. 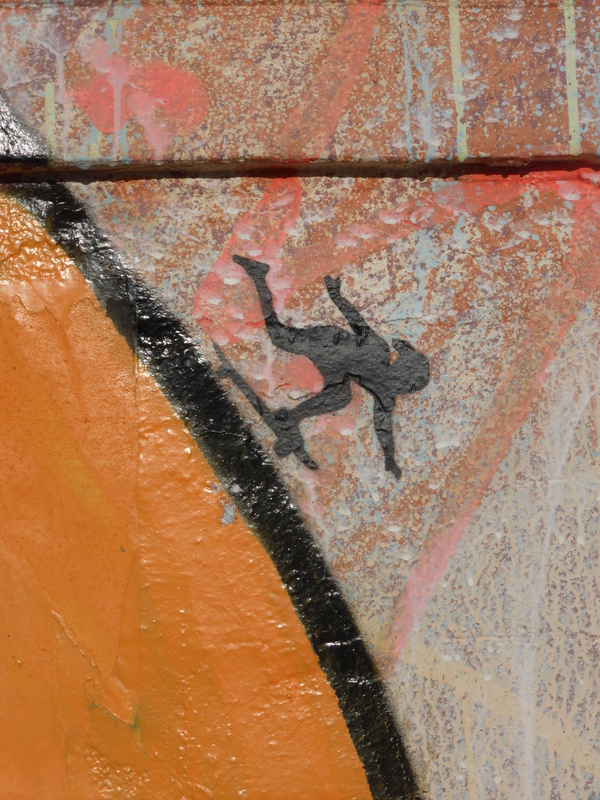 Work by Alaniz on the bridge over the canal in White Post Lane. 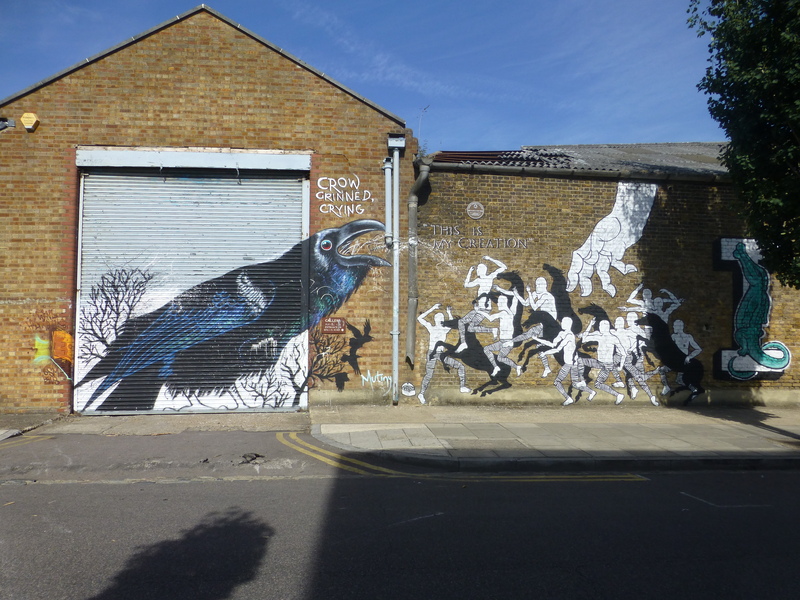 3: As you reach the Alaniz piece on the bridge (above) turn right along the canal, in sight of the Olympic Stadium, and follow the canal all the away along until you reach Wick Lane where you will see a superb piece by Borondo on the abandoned pub building. 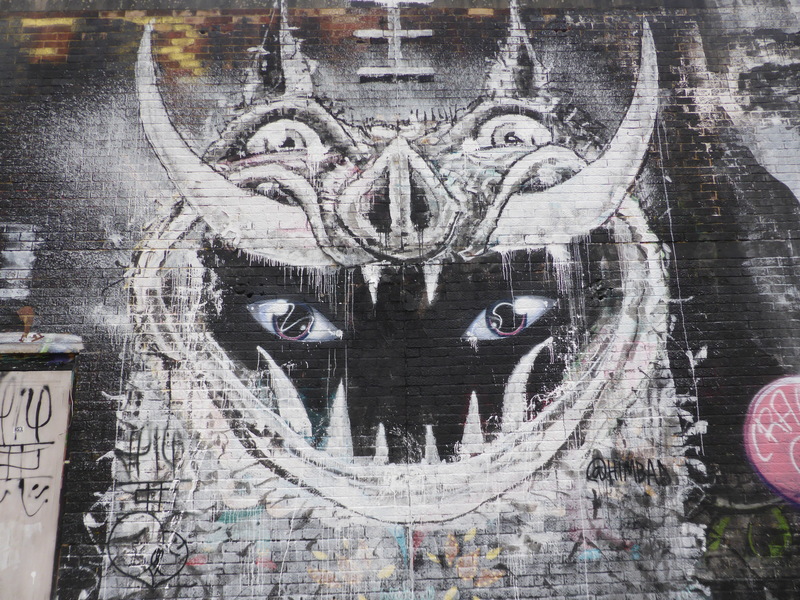 As you walk along the canal you will see a whole host of works, with a large feature wall which is subject to regular changes. The stand out work along this section and of London as a whole is Borondo’s “Narcissus” work, it’s worth the visit to the area for this work alone. 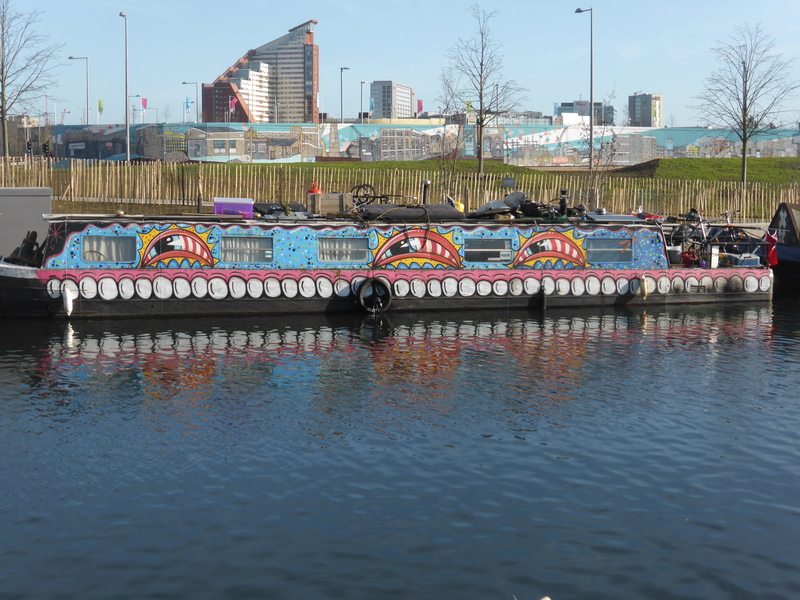 Also be sure whilst walking along the canal to keep your eyes peeled for any painted canal boats. 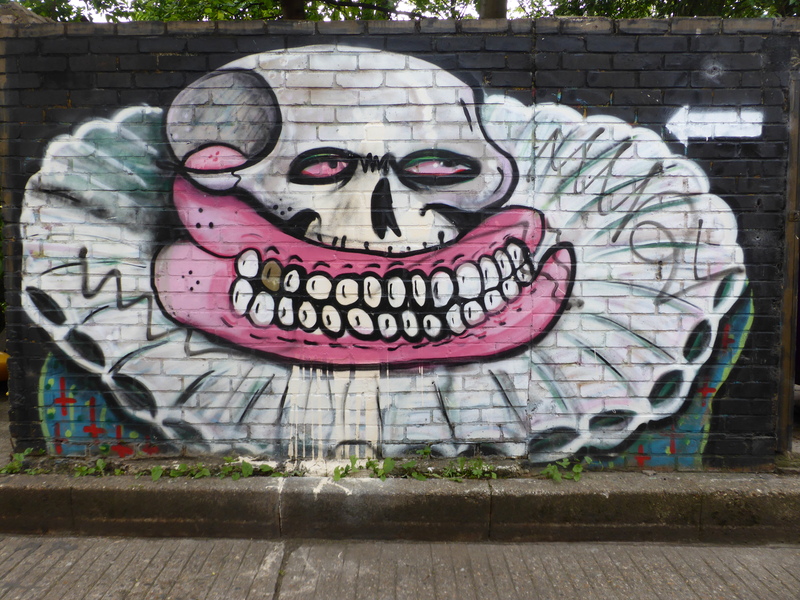 Floating work by Paul Insect & Sweet Toof . 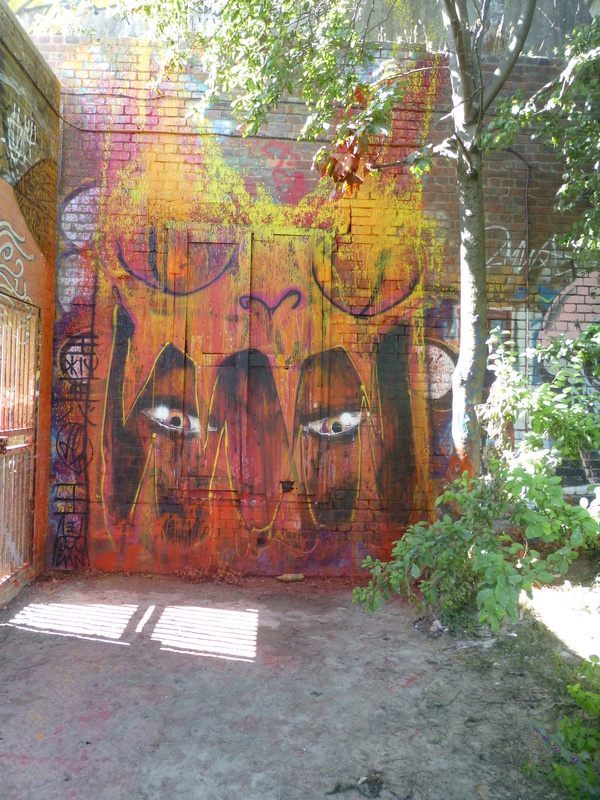 Work by The Real Dill & Tony Boy. 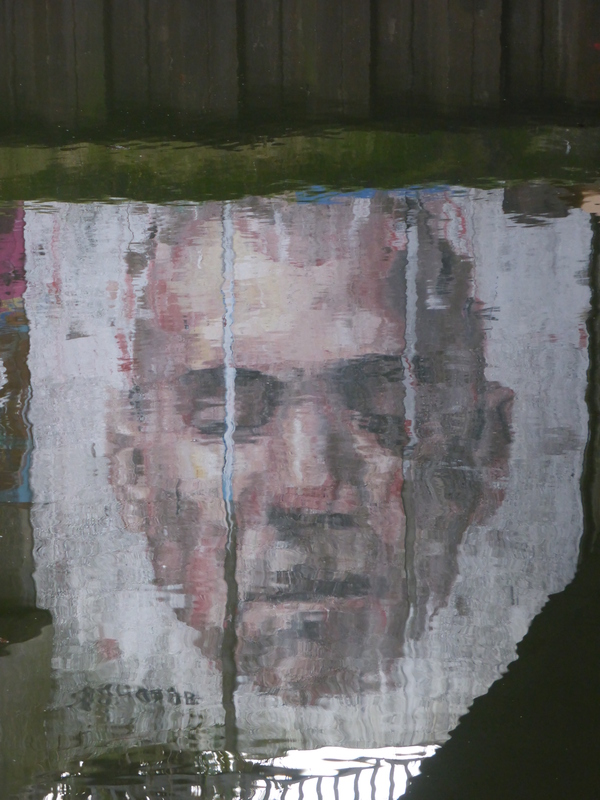 Borondo’s upside down painting, intended to be viewed reflecting in the water. 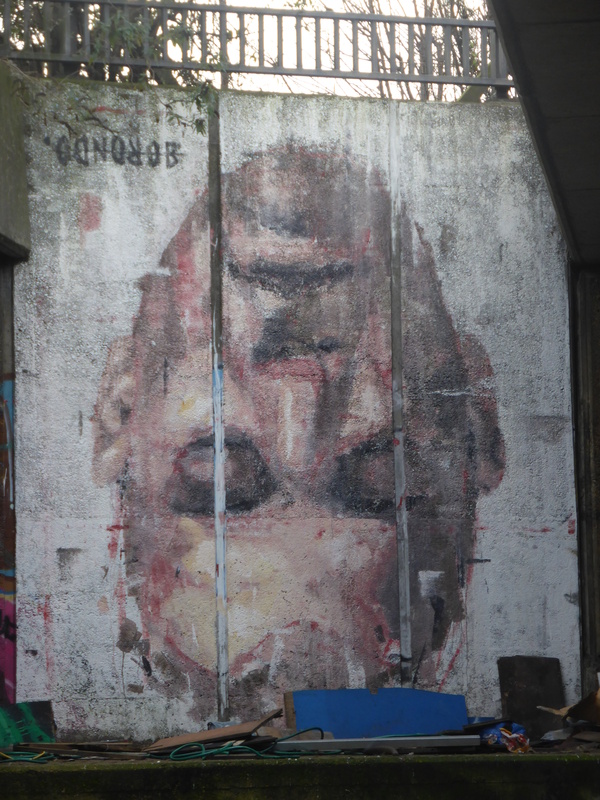 The reflected image of Borondo’s work, the only way to see the piece the right way up. 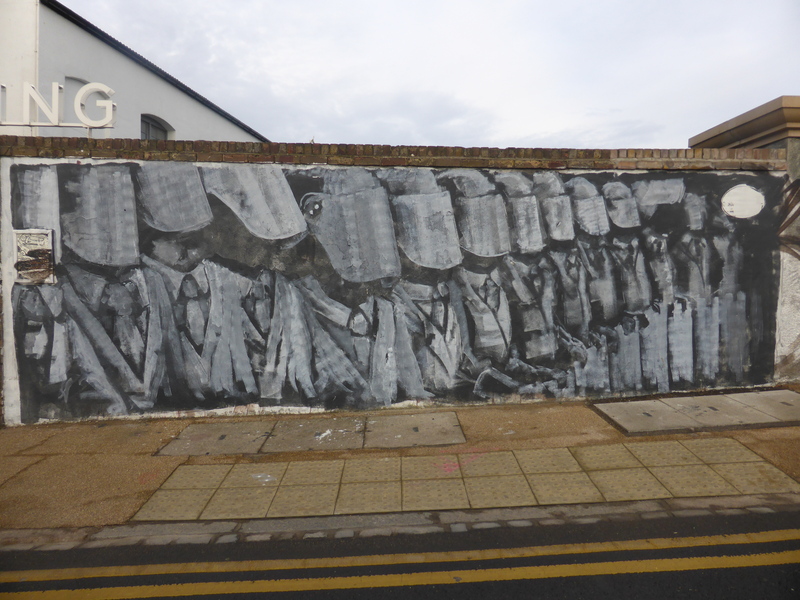 Work by Borondo on Wick Lane. 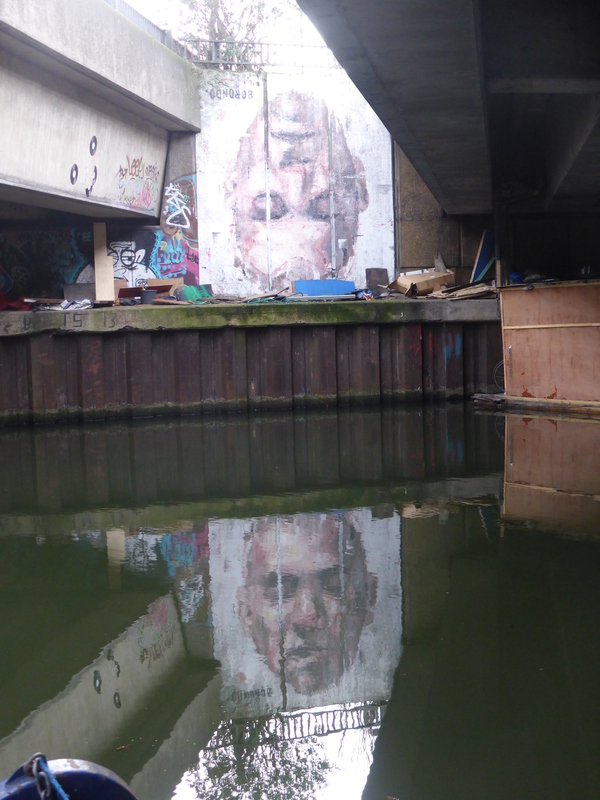 4: Having viewed the work by Borondo on Wick Lane, travel back along the canal and cross over the bridge you passed into Fish Island. Here walk along Roach Road and follow the road around until you reach Stour Road on your left and go along keeping an eye out for a little car park with a Sweet Toof work in it. As you reach Bream Street on your left you will see the biggest painted wall on Fish Island with works currently from Edwin, Nemo’s & Himbad. 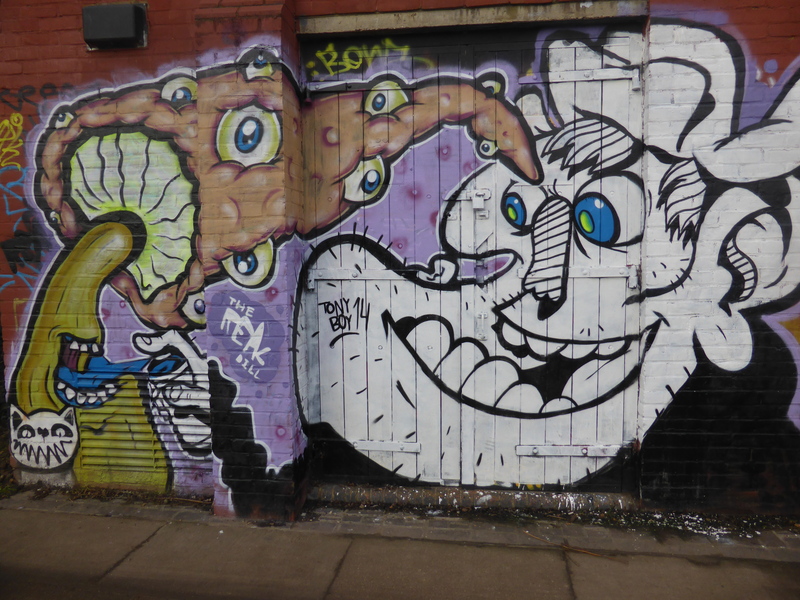 Work by Sweet Toof in Stour Road. 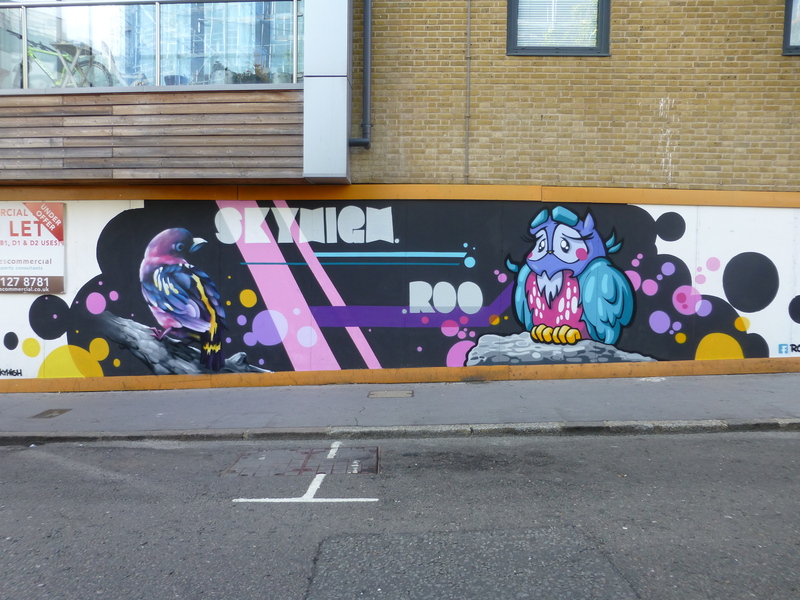 Work by Edwin in Bream Street. 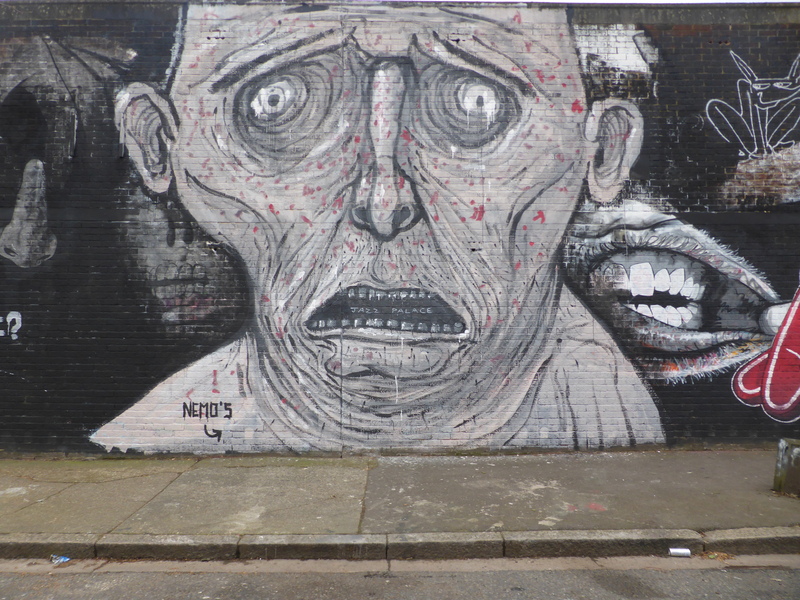 Work by Nemo’s in Bream Street. 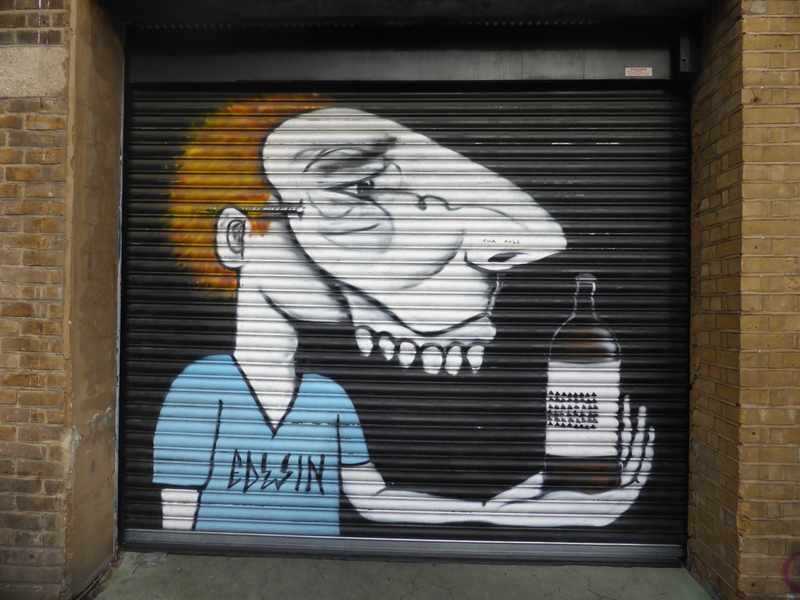 Work by Himbad in Bream Street. 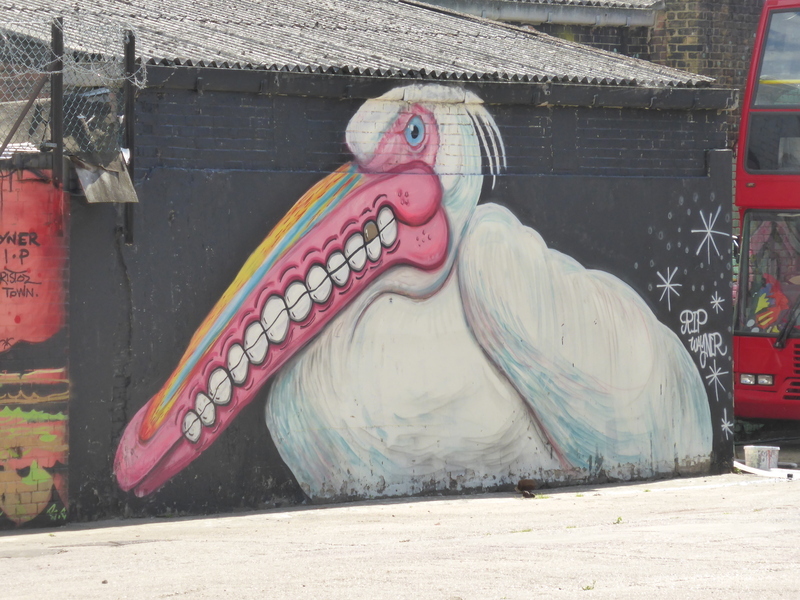 5: When you reach the end of Bream Street turn right and walk along Dace Road, as you reach the end of this section of Fish Island there are Sweet Toof works galore to be seen. 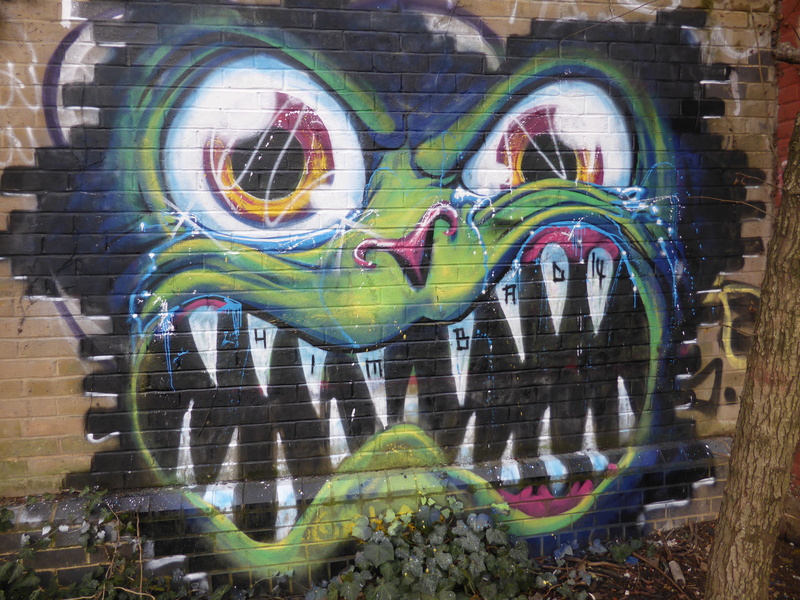 As you reach the bend in Dace Road there is a courtyard featuring several works from Sweet Toof, and next to this is a delightful wall which has featured a year long battle between MOBSTR and the local council. 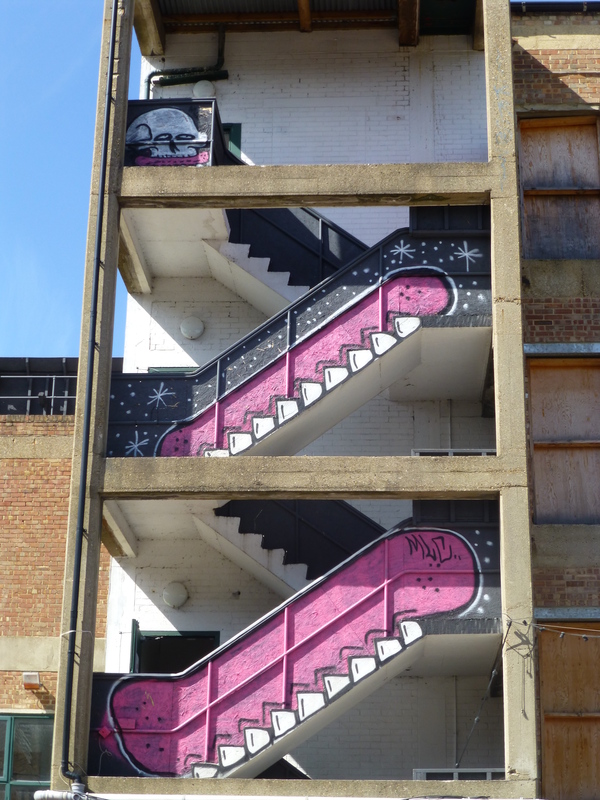 Next to this wall by MOBSTR is a set of stairs up to the Bow Flyover, just up here is some more work from Sweet Toof. When done here head back down the stairs to the bend in Dace Road. 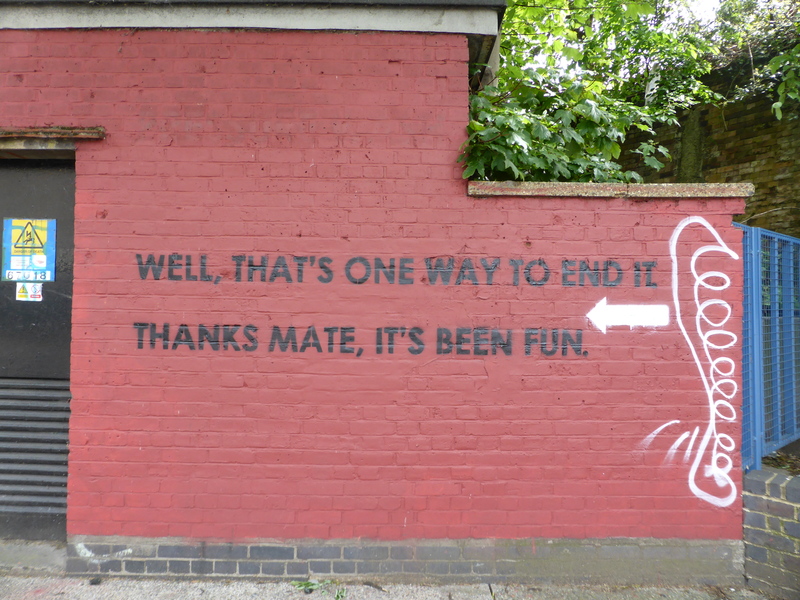 Work by MOBSTR on Dace Road. 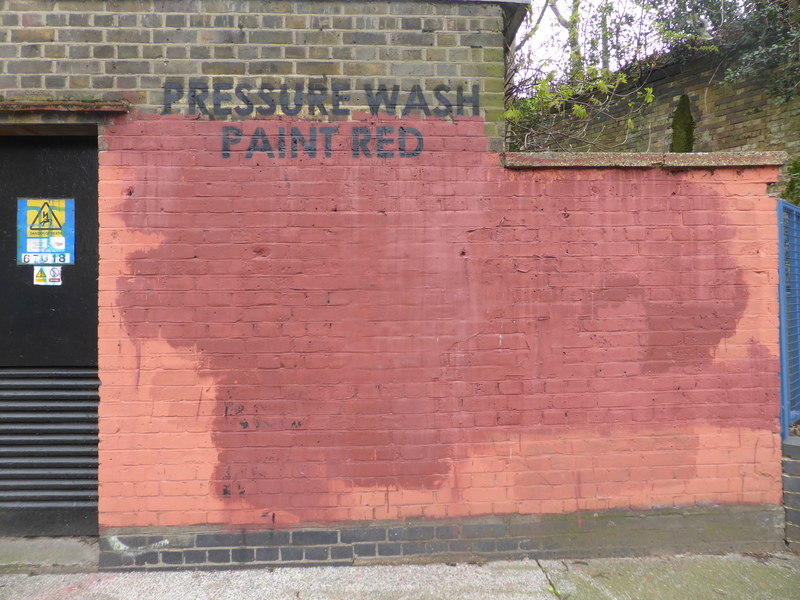 Work by Pang on Dace Road. 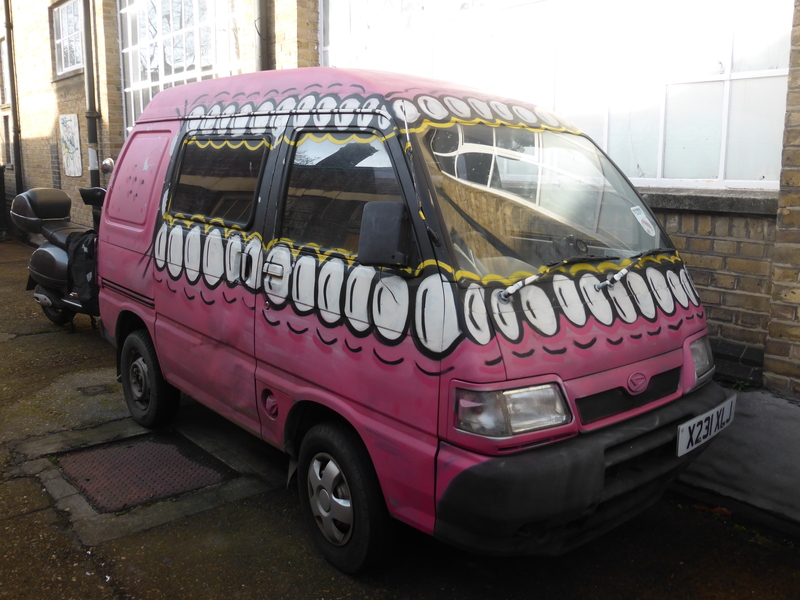 6: When back in Dace Road there is a large courtyard that is also viewable from the adjacent Smead Road and is absolutely packed with Sweet Toof works. unfortunately this is locked to the public, but you can still sneak a peek of these works through the fencing. 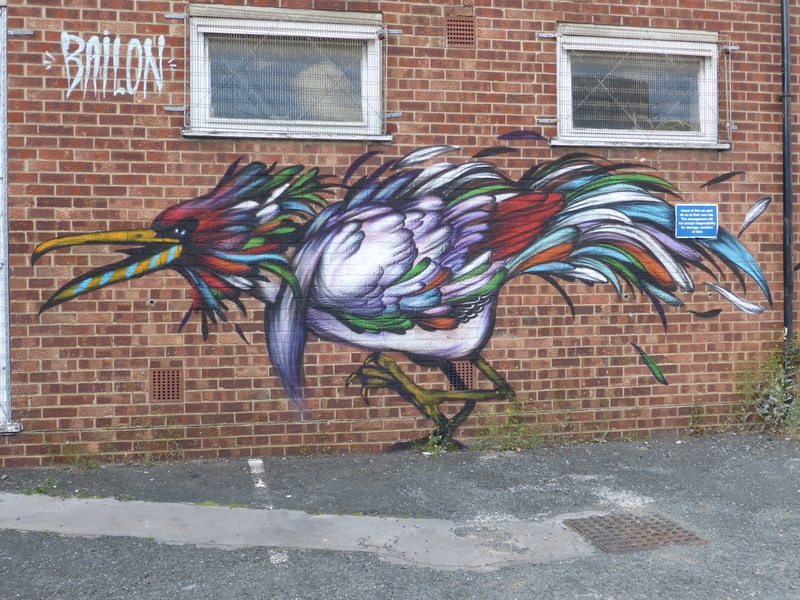 When done here head back along Dace Road to the very other end until you arrive at the Plough Cafe at Swan Wharf, which is packed with high quality Street Art featuring works from Ben Eine, Faith47 & Hannah Adamaszek. 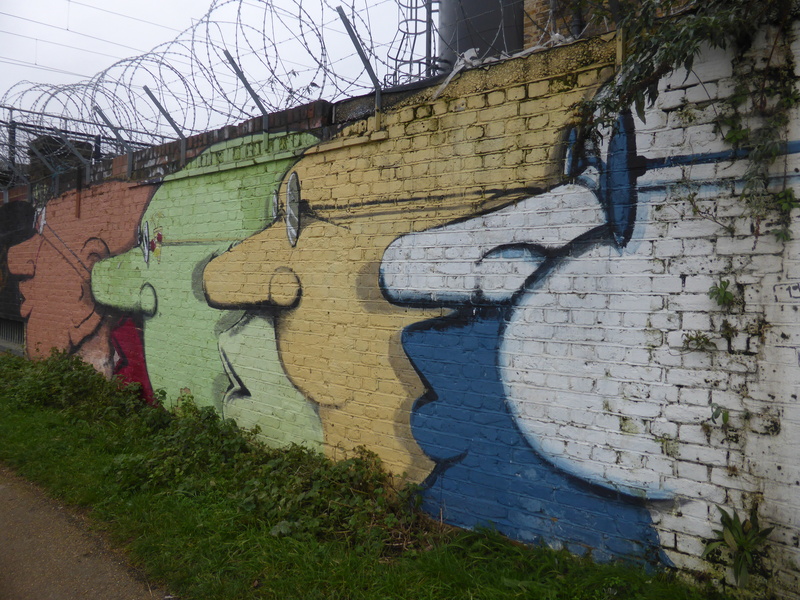 Work by Pez on Dace Road. 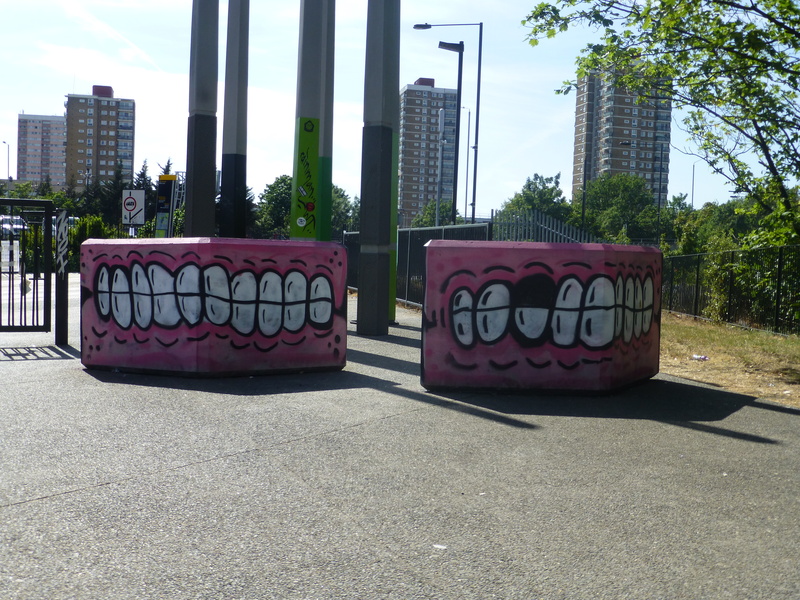 Work by Sweet Toof at Swan Wharf. 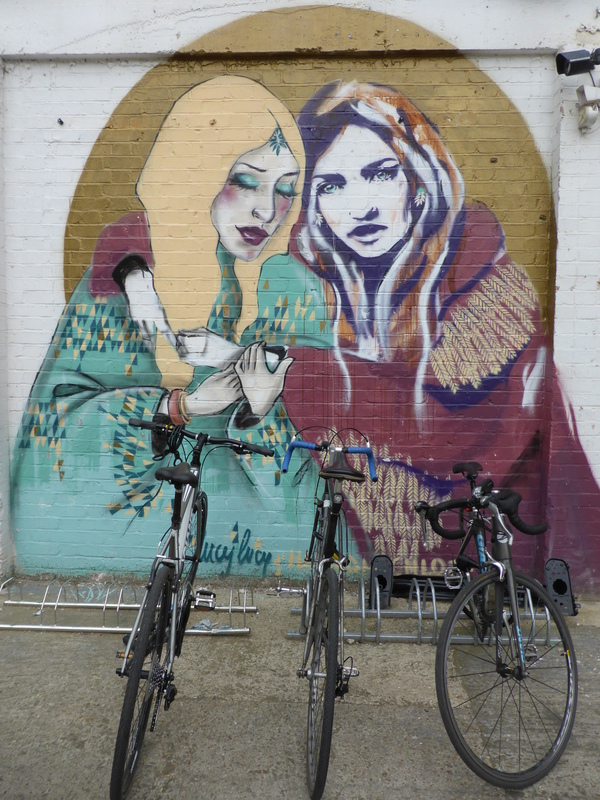 Work by Faith47 in the premises of the Plough Cafe. 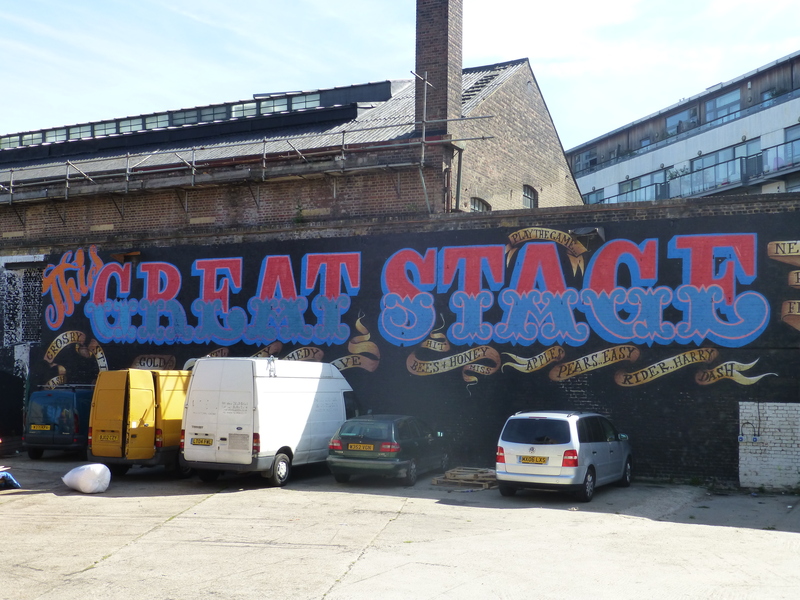 Work by Ben Eine in the premises of the Plough Cafe. 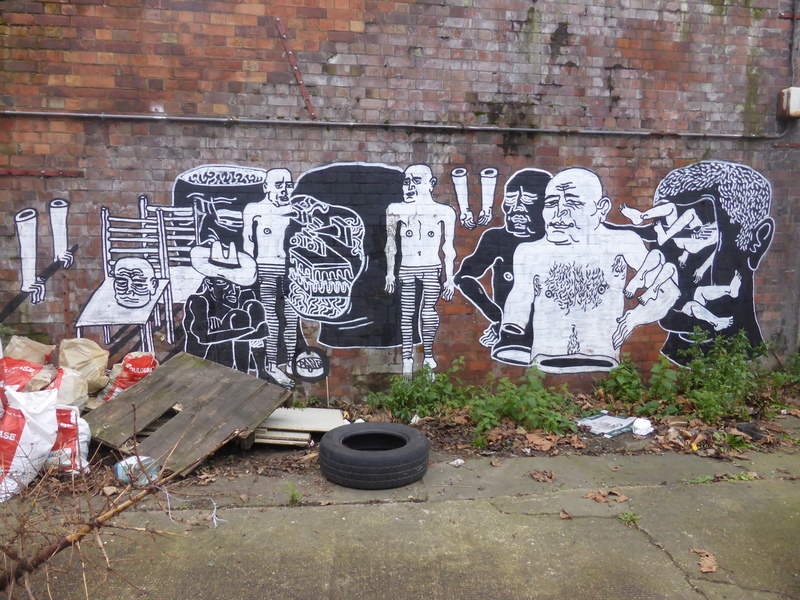 Work by Hannah Adamaszek & Lucy Lucy in the premises of the Plough Cafe. 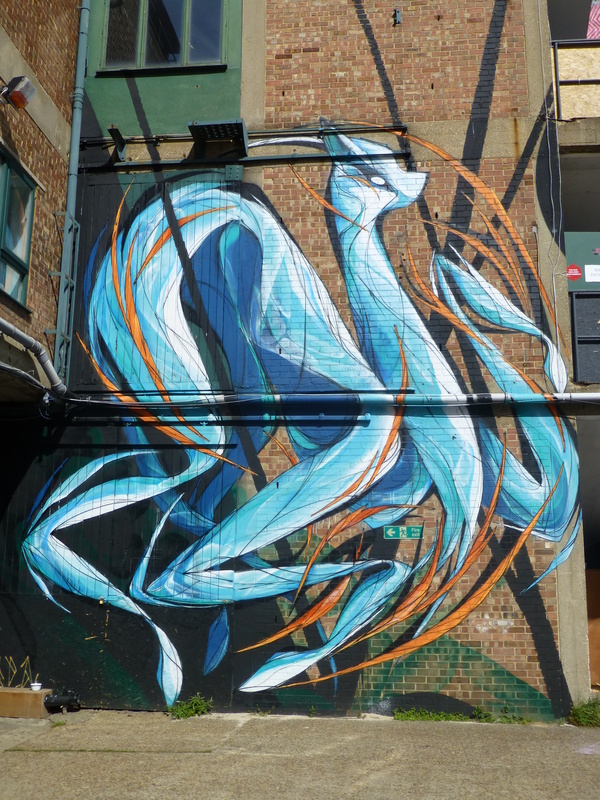 Work by Australian artist Shidain the premises of the Plough Cafe. 7: When done in the Plough Cafe cross over Swan Wharf to the other side of the canal and walk along to the right to see a few pieces by Israeli duo Broken Fingaz Crew and then go back to the left and follow all the away along until you reach the bridge past the Olympic Stadium where you started out along the canal initially. 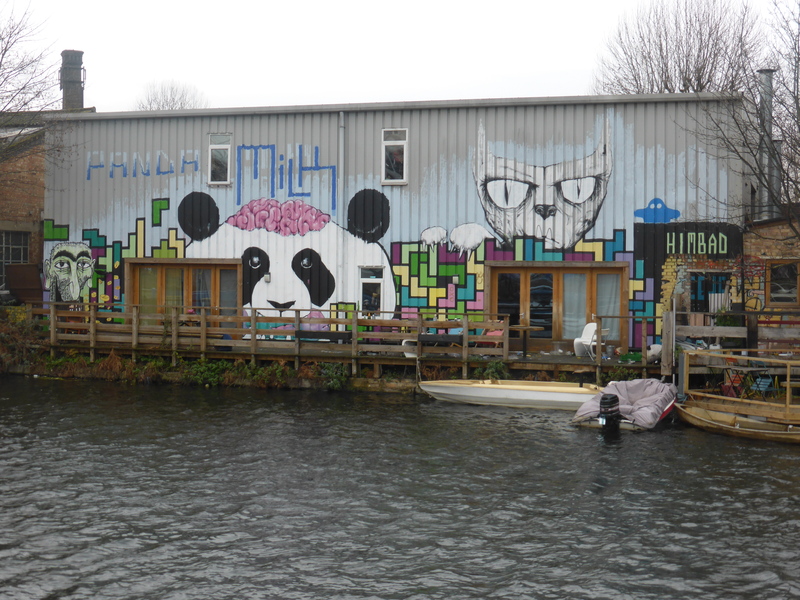 Be sure to keep an eye out along the canal for decorated house boats and for the artwork along the buildings and former factories and warehouses across the canal, but only visible from this side. 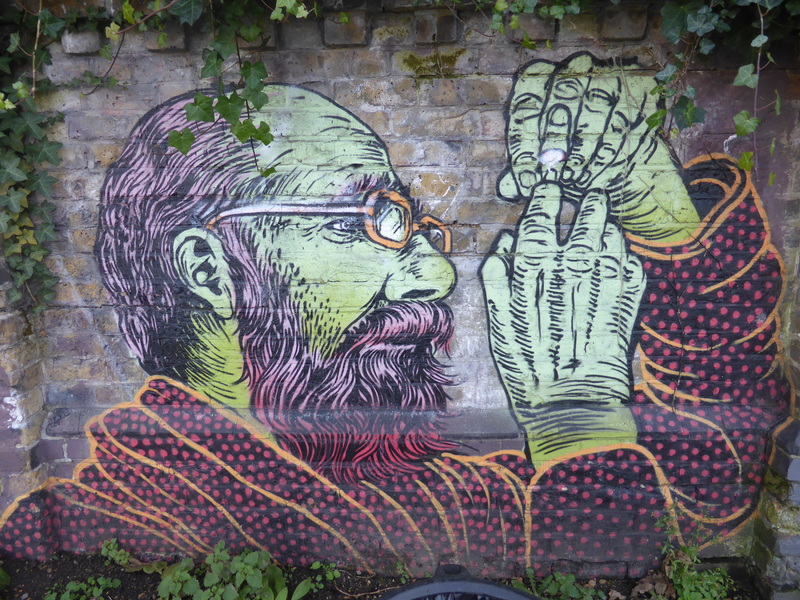 Work by the Broken Fingaz Crew. Work by ? & Himbad. 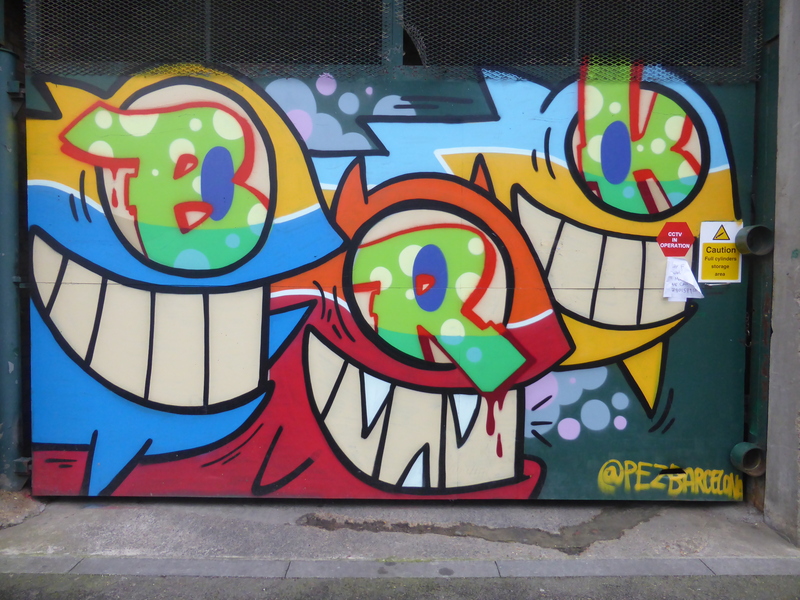 Work by Otto Schade & Boxhead. 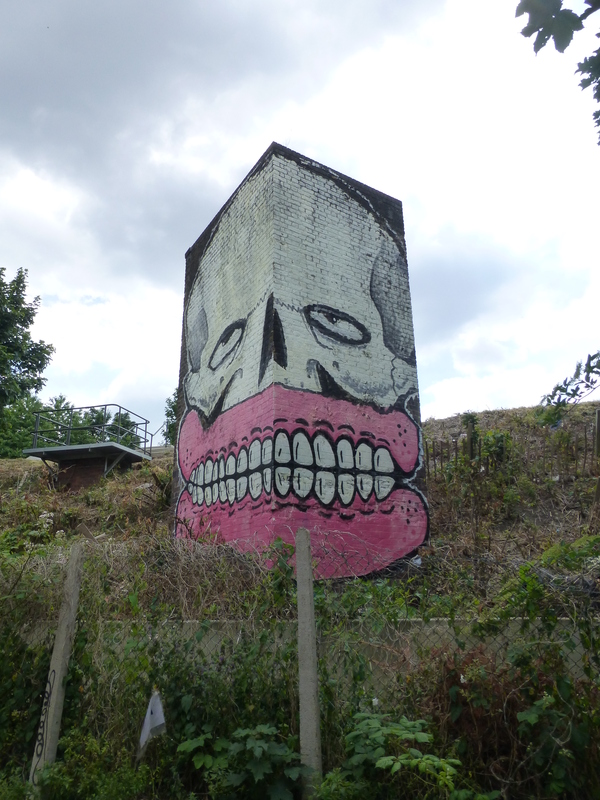 Work by Frankie Strand along the canal. 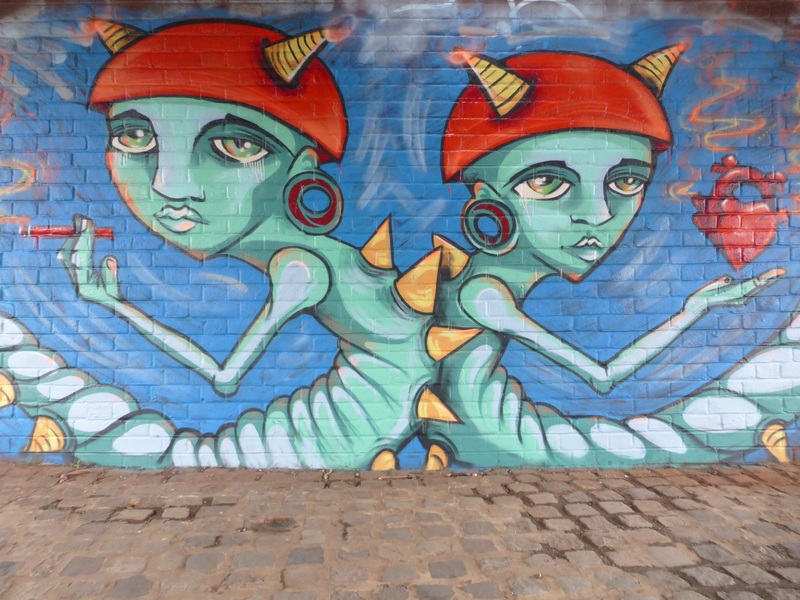 Work by Elno along the canal. 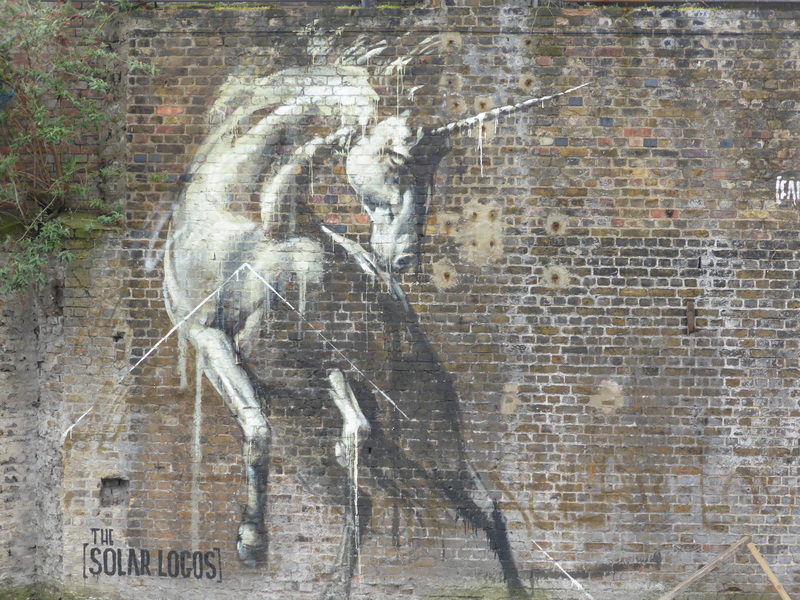 Work by Run along the canal. 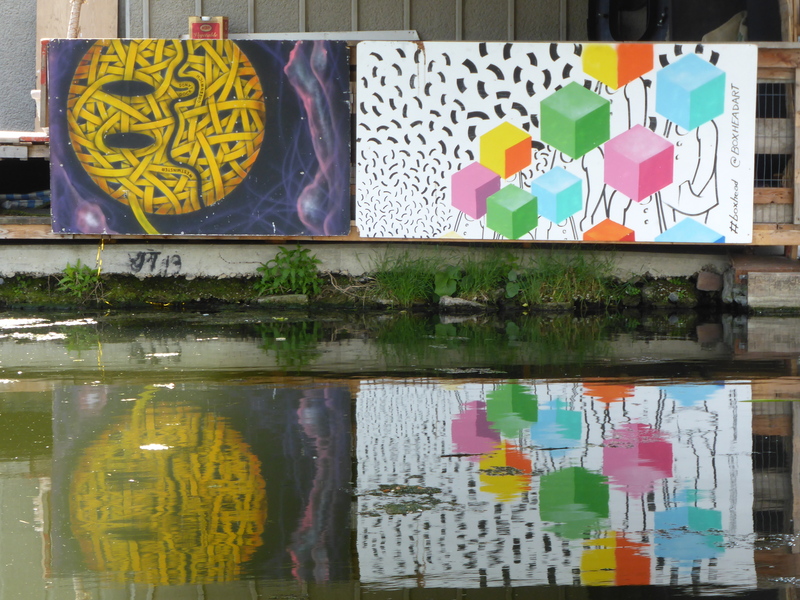 Work by Teddy Baden along the canal. 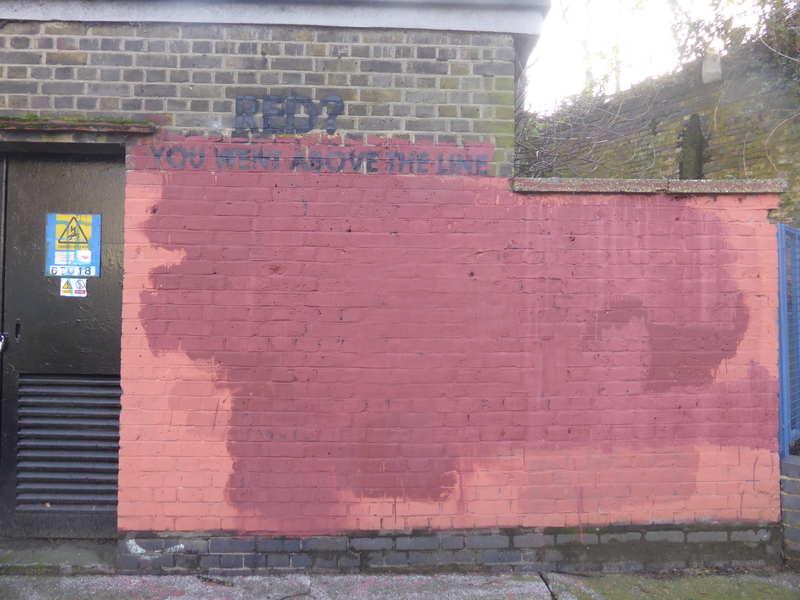 8: When you reach the bridge where you started out along the canal peek just further on for some more great pieces canal side and then head up the stairs and head back along White Post Lane until you arrive back at Hackney Wick Overground Station concluding the walk. So much exciting new work to go along with the old. 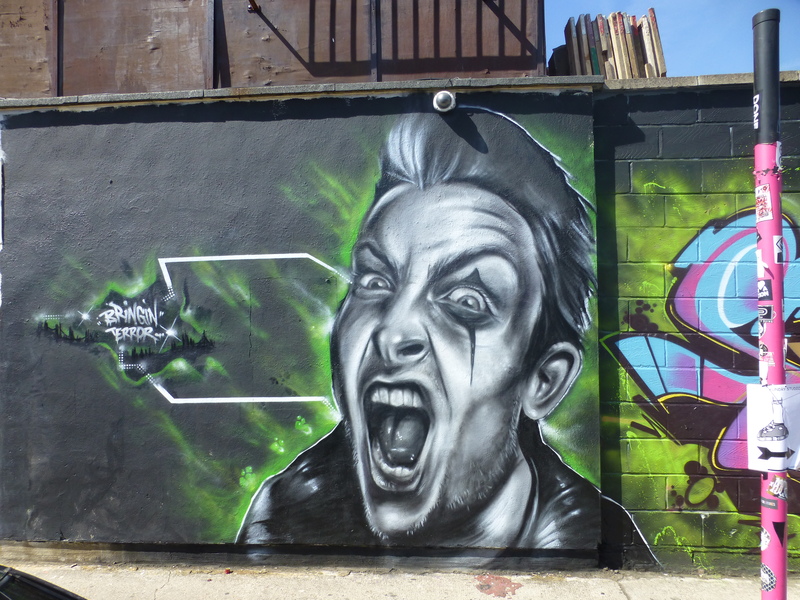 I saw the crow/Pang collab a couple of weeks ago but couldn’t find out who painted the crow. And now I know. Another wondeful post.